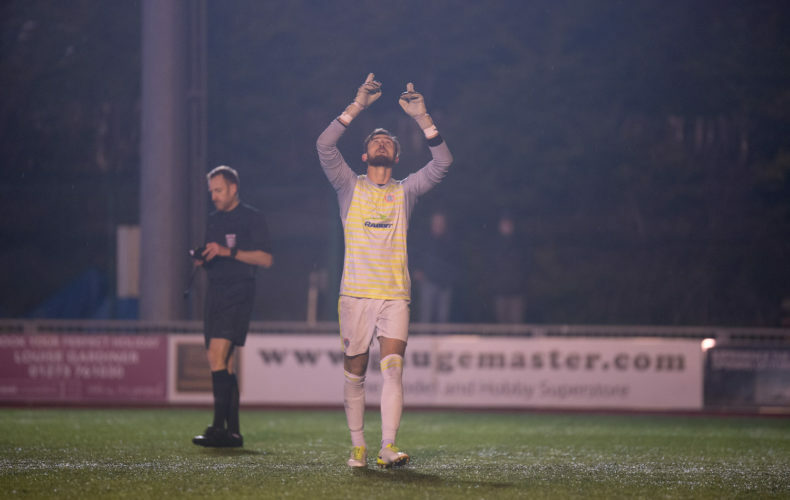 Goalkeeper, Kleton Perntpeoy was the penalty-saving hero, as Worthing need spot-kicks to get past Tonbridge Angels in the second round of the Velocity Trophy. 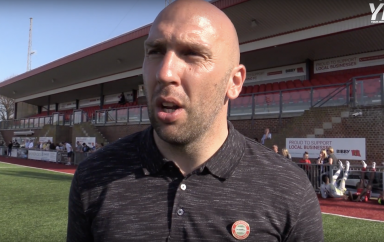 There were several changes to the team that began the 1-1 draw at AFC Hornchurch, as Aguiar and Kealy kept their places, after coming off the bench on Saturday, with Darren Budd given the night off and Ovenden and Rance getting rare starts. Rents returned from suspension, while Barker, Clarke, Ajiboye and Starkey joined Skerry as ready-made replacements. It was the Kent-based visitors who were first on the attack but Craig Stone’s effort sailed over the bar. Alex Parsons came much closer, just two minutes later, when his shot from an acute angle out on the right, struck the base of Jon Henley’s near post, after Ricky Aguiar’s pinpoint, crossfield pass had picked out the marauding wing-back. With the game still in it’s infancy, Reds breathed a sigh of relief, as Joe Turner miscued his attempt on goal after Jared Small’s cross had only been half cleared. Callum Kealy almost announced himself on the scoresheet, by heading Sam Rent’s free-kick onto the roof of the net, while Kleton had to be alert, using both fists to punch away Turner’s rising drive at the other end. An unusually quiet atmosphere, thanks in most part to the chilly night air, wasn’t helped by a goalless scoreline, as we reached the half-hour mark. Despite that, Reece did his best to warm the crowd by darting along the edge of the penalty area and firing in a low shot, that forced Henly to get down low to keep it out. Followed by a repeat of the Aguiar – Parsons link-up of earlier, that saw Angel’s number one earn his corn again as our number two, this time, tested his reflexes. However, just as the queue for Tea, Coffee or, indeed, anything hot slowly started to get longer, Liam King made the travelling support, for a moment at least, forget the cold as he drilled a shot across Kleton and into the side of the net, from Adam Ramadan’s left-wing cross, to give his side the lead. One very nearly became two, as our colourful custodian held a header from Blue’s Captain, Sonny Miles, right underneath the crossbar, little more than a minute or so before the break. A lively beginning to proceedings after the restart, saw James Crane have his effort blocked, Zack Newton’s follow-up loop up into the hands of Henly and Will Miles almost gift The ‘Ton a two-goal cushion, as his error was pounced upon by King, who could only pull his attempt wide with just the goalkeeper to beat. Miles then redeemed himself with a headed clearance off the line, as Small’s right-sided delivery threatened to creep in, before his namesake, Sonny, managed to put his header the wrong side of the post, when he looked certain to score. Liam Smith showed why he’s a left-back, merely scaring a passing pigeon into taking evasive action, with a shot…well, you get the gist, until Super Sam Rents gave a fine example of how it should be done, fizzing the ball past Henly with the outside of his trusty left boot, to level the tie. Turner missed a sitter and Jazz Rance seemed to be distracted by the bright street lights of Woodside Road, as both sides tried, desperately, to avoid the dreaded penalty shootout. David Ajiboye was introduced, at the expense of the unfortunate, Rance and immediately set about seeking out a winner, pouncing on a misplaced pass and bursting through the backline, only to be forced wide and look up in frustration, when Henly held the ball tantalisingly close to the top corner. A rampaging run from Reece Myles-Meekums, ended with a classy backheel in the box to Kealy but a blue shirt threw itself in front of the Aussie-born striker’s shot. Entering the final five minutes of the normal ninety and Ajiboye featured in the build-up once more, although Ovenden’s subsequent screamer left the occupants of the adjoining flats doing a similar thing as he found their back garden, rather than the back of the net. The two teams then ensured any Seagulls in the local area made a quick diversion, by avoiding the target in equally wild ways, before Ovenden left the neighbours peering out of the windows in a somewhat less nervous manner, simply locating the gloves of the bearing-down Henly in stoppage time and so, the victors would be decided from twelve yards. The pattern of the penalties went in a sequence of missed, missed, scored, scored, for the first ten, as the competition rules were quickly scanned to see if paper, scissors, rock featured as an option. Although, that would be doing a disservice to the two ‘keepers, who saved exactly half of them, even if Reece’s effort looked to have crossed the line. Tommy Whitnell broke that run with kick number eleven, KP stopping that one too, which left Alex Parsons to send Worthing through to round three and a home tie against Merstham.